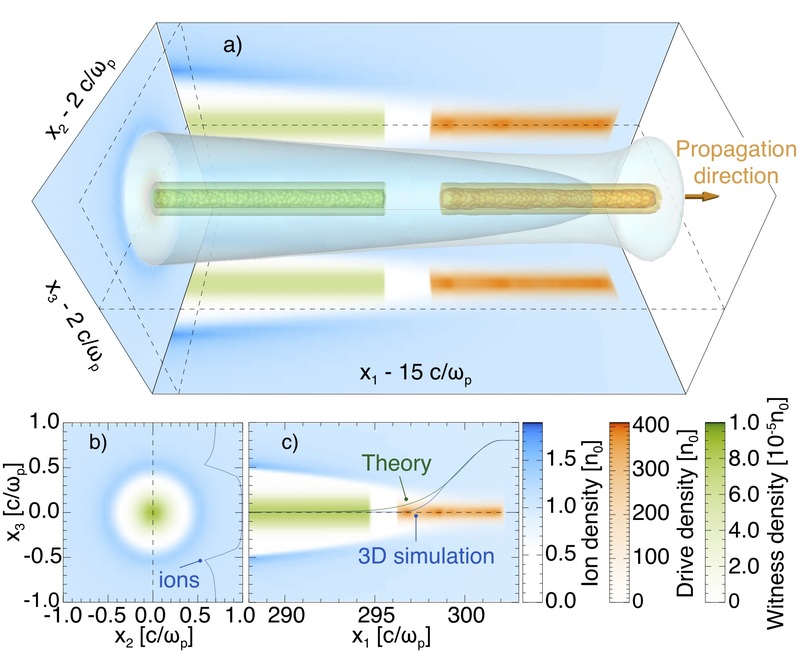 Recent experiments have unravel the potential to efficiently accelerate electrons of plasma wakefield accelerators [M. Litos, Nat 515 92 2014]. Aiming at the development of new linear collider facilities, where the beams to collide share energies beyond the present energy frontier will share light on new physics: from novel interesting fundamental phenomena to adapting our basic concepts, made our plasma wakefield acceleration community duel on how to accelerate positrons as efficiently as electrons [S. Corde et al., Nat 524 442 (2015)]. In this context we have been investigating the formation of a plasma scheme suitable for accelerating positrons to high energies. The setup consists of a tightly focused energetic positron bunch that travels through an uniform plasma of electrons and ions. It’s space charge is capable of not only bringing electrons towards its axis of propagation as it repels ions strongly enough, and for long enough, to have them form a hollow void cone behind the bunch, the hollow channel region. We are currently exploring the application of this mechanism for the acceleration of positrons. The figure shows the 3D view (a) of this technique as well as the transverse and longitudinal cuts, (b) and (c), respectively. In this figure the drive bunch (orange) that propagates through the plasma of electrons and ions (blue) forms wakefields suitable for the acceleration of trailing positron bunches (green) since they provide high accelerating gradients and almost no transverse forces. For more information, see L. D. Amorim, et al., Positron plasma wakefield acceleration in a self-driven hollow channel, AIP Conference Proceedings 1777, 070001 (2016), available here.